Aaron Franklin's Blog Update: Remembering "Stan The Man"
Stan Musial, one of baseball’s greatest hitters, died Jan. 19 at age 92. While lesser acclaimed than contemporaries like Ted Williams and Joe DiMaggio, ‘Stan the Man’ was a hero and inspiration to fans across the Midwest and South who grew up listening to St. Louis Cardinals’ broadcasts on KMOX radio. My wife and I sneaked away, along with another couple, from the Thursday evening program of the Southern Baptist Convention’s 1961 meeting in St. Louis to watch a baseball game at the old Busch stadium. The Dodgers were in town, and their phenomenal Sandy Koufax was listed as probable pitcher. As it was a rather chilly May evening, the crowd was neither large nor -- as Koufax sat down batter after batter the Cardinals sent to the box -- enthusiastic, except when Stan Musial came to bat. And even “Stan the Man” struggled until into the fourth inning. Winding his tall frame down into the famed “corkscrew” crouch, he took a couple of Sandy’s pitches, and then that exquisite moment happened. Uncorking from that twisted position, bat and “the Man” came unwound together in a fluid blur, and a perfectly placed Texas leaguer arced into the hole behind second. Even though in his later years, Musial moved smoothly as quicksilver to first as the sparse crowd came to life. This was what we’d come to see, and Stan Musial had brought home the goods. Another hometown hit, and those eventually totaled 1,815, equaling exactly his number of road-trip hits over an amazing career. Koufax went on to eke out a one-run shutout victory that evening. A couple of years later, in Kansas City, I was thrilled to watch Mickey Mantle arc an also perfectly placed line-drive home run just over the center field fence. And even with the hard-throwing Whitey Ford’s precision pitching, the Yankees gave that game up to the Athletics. 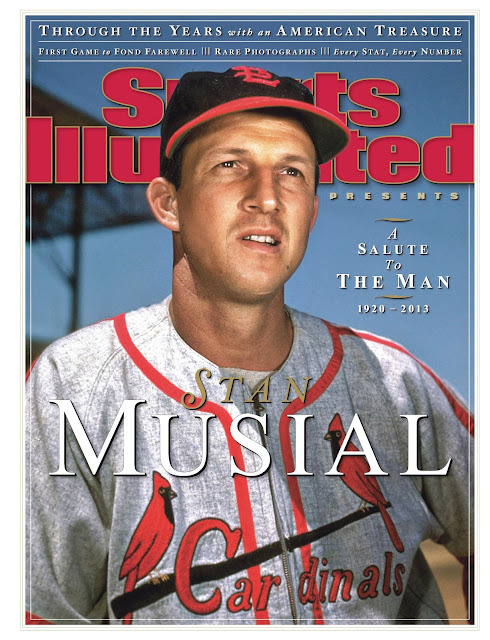 Stan Musial never failed to get significant numbers of homers in 20-plus seasons with the Cards, but having seen this outstanding batter produce a perfect single created as great a memory as “The Mick” hitting a perfect homer. In this game of life -- and perhaps gamesmanship of nations and agendas – consistency, that is, standing in the box (even as Musial on his left-hand side of the plate) ready to beat out a hit, can advance a teammate runner or help a colleague or friend or spouse or child reach home plate. Hitting consistently is reaching first base, challenging opposition, nudging away the timing of the best pitchers the Kingdom’s enemies send to the mound, and building win margins as significant as ninth-inning home runs, thrilling though those moments seem. Victory is not only to the swift nor battle to the strong. Quietness and confidence may give even greater strengths to our every contest and playing field.